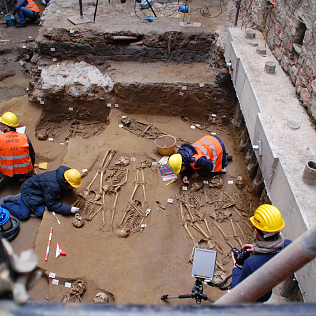 More than a year ago, during the works for the New Uffizi, excavations have uncovered part of a cemetery dating back to the 5th-6th centuries AD. The early Middle Ages has still dark areas about which we don’t know much, during which Florence passed periods of tremendous crisis. The 60 bodies found were placed head-foot, inside multiple graves: this testifies to the haste with which they were buried. Therefore an exceptional event caused the death of many people, in a short period. The fact that the cemetery is in an area very close to the river, at that time subject to its floods, brings to mind a fact of considerable proportions, which could be linked to the crisis of the town of Florence, which has been mentioned. The bodies do not show fatal wounds, nor signs of starvation, this is the reason why the hypothesis of the siege by enemies has been excluded. What happened then? After the examinations on the bodies, researchers have supposed an epidemic, probably of plague, but studies are still ongoing. The period is the same of the \"Plague of Justinian,\" which also hit Italy and was caused by the same bacterium of the famous “Black Death” of the 14th century. The finding has an important value to historians. By studying these bodies, we will get a lot of information on lifestyle, feeding and health of the Florentine people of that period.